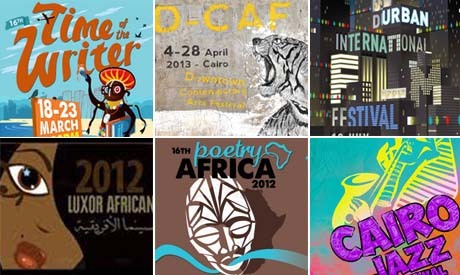 During his short visit in Cairo, Ahram Online talks to Peter Rorvik, a jury member at the Luxor African Film Festival, about his experience in developing successful arts festivals throughout the African continent. Peter Rorvik is a former director of the University of KwaZulu-Natal’s Centre for Creative Arts (CCA). Since 1999, Rorvik was the director of four major arts festivals held annually in South Africa, including: the Durban International Film Festival, Time of the Writer, JOMBA! Contemporary Dance Experience and Poetry Africa. In January 2013, Rorvik gave up directorship of the festivals and has been appointed as the new secretary general of the Arterial Network, a dynamic network of individuals and organisations dedicated to the creative and cultural sector all across the African continent, headquartered in Cape Town. Ahram Online talks to Peter Rorvik about his experience in major festivals and audience development practices. Ahram Online (AO): You were among the jury members of this year’s Luxor African Film Festival, which was held in March. What is your assessment of the festival’s organisation and contents? Peter Rorvik (PR): Without a doubt, there was a very interesting line-up of films; a commendable fact for such a young festival. I come from the festivals background and I am sure that, logistically, the Luxor African Film Festival will develop with time. AO: What brings you to Cairo now? PR: Now, since being appointed the secretary general of the Arterial Network, I am particularly interested in getting to know more about the country’s cultural life. We already have a strong cooperation with Al Mawred Al Thakafy and we are continuously looking to incorporate new persons into the network of art and knowledge exchange. AO: The cultural networking and exchange you’re talking about is equally evident in a multitude of the Africa-based cultural festivals you have been organising over the past years. Are those the main aims of those events? PR: Yes, but not only. Arts festivals are an opportunity to celebrate arts and culture as well as provide a platform where we are able to underscore the diversity of cultures. But the festival organisers should also realise that their role is to create truly meaningful development possibilities, including opportunities for disadvantaged or marginalised creators, among whom we can find those who are censored in their home countries. PR: Writers are usually extremely “solitary” in the process of creation. Therefore, literary festivals allow them to create a fascinating intellectual exchange with other thinkers. Not to mention that it is a big gain for all the attendees of such festivals; to meet, listen to and interact with those creators. Last year, we hosted Egyptian Bahaa Taher at the 2012 Time of the Writer Festival. He is a remarkable writer and is humanitarian. AO: You were also organising film festivals. What are the main motivations between those events? PR: As previously said, festivals in general aim to give a wide platform for expression and exchange between all the participants, artists themselves and the audiences. Film festivals, such as the Durban International Film Festival, try also to provide a stage for different narratives. With cinema being dominated by Hollywood productions, it is crucial to bring to the surface other alternatives and cinematic riches. AO: With your experience in heading up such a variety of festivals, is there one formula and what are the tools to develop the audience? PR: Each festival is different and, naturally, targets different audiences. The core of audience development lies in recognising the product we are offering and then the audience of the event. Who are we targeting? Who are the guaranteed attendees and who are the new potential audiences? Once this is recognised, we can start thinking about the proper tools we’ll use to reach those audiences. Some people would react to an email, others to a text message; others need to be approached through other marketing strategies, flyers, advertisements etc. Yet it all goes back to the awareness of who you want your audience to be. PR: It is a worldwide challenge. You cannot include everyone and some choices need to be made. It is very hard to create a festival that would appeal to everyone. Moreover, one creates an obvious selection by setting specific programming, ticketing etc. However, as the festival or any other periodical event develops, the organisers always have an opportunity to continuously develop new audiences, carefully. AO: How does bringing in a big name help a festival? PR: When one brings a known talent, he or she automatically gains a lot of attention. This is when the organisers who wish to reach to new audiences, need to create a clever balance. A big name can be an important backbone for the local artists who otherwise do not have sufficient exposure. As such, with intelligent planning and programming, any festival can help young and still unknown people to kickstart their careers. So, it is not only about the big names for the sake of the audiences, it is also an important opportunity for other artists to become more visible. AO: What other tools would you recommend in the process of audience development? PR: Workshops and training opportunities are an important element of any large artistic event. The organisers should be committed with the same capacity to creating workshops as they are dedicated to marketing all core events of the festival. Addressing youth and especially the youngest potential attendees is a great long-term gain. Very young people and children are particularly perceptive and their fresh minds are able to absorb a lot of values. With events especially tailored for them, they develop. The key is to invite them and inspire. Remembering values they were offered, they will come back in the upcoming editions of the same event. Also, they will remain interested in arts and culture activities throughout their lives.